Like many children, Maxwell adores Disney. 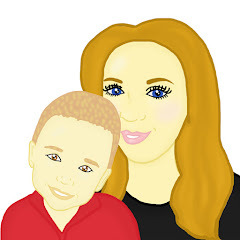 Recently he has been addicted to watching Disney Life and one of his favourite films he has been watching is Finding Nemo. With this in mind I thought it would be the perfect idea to create him some fun Disney recipes which he can enjoy. 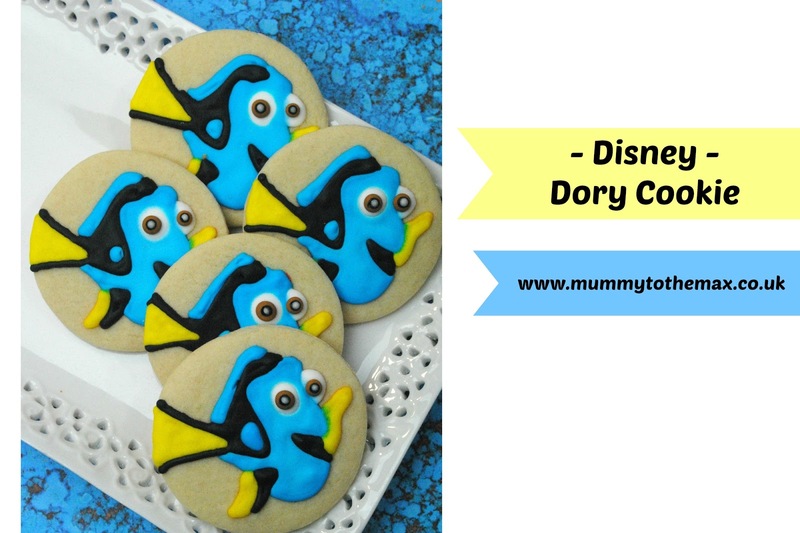 Today you are able to view my Disney Recipe! 1. Cream the soft butter with the sugar until the combination is smooth in a mixing bowl. 2. Add all 4 eggs at one time. Continue to mix. 3. Add the vanilla. Continue mixing. 4. Sift the four, baking powder, and salt together. 10. Pull the cookie dough out of the refrigerator and leave at room tempature to soften. 13. Line a baking tray with grease proof paper. 14. Using a metal spatula move the cut cookies to the baking tray. 16. Take the cookies off of the baking tray and put on a wire rack to cool completely. 1. Combine all ingredients in a mixing bowl mixing on medium speed for 4 minutes. Make sure you do not mix your food colouring in at this stage. 2. If icing is not stiff enough add 50g powder sugar. -Divide the icing into 5 equal bowls. -The first bowl of icing remains white. 3. The second bowl of icing, add several drops of blue gel food colouring. Stir to mix. 4. In the third bowl, add several drops of black into the icing and mix. 5. In the fourth bowl, add several drops of brown into the icing and mix. 6. In the fifth bowl, add several drops of yellow into the icing and mix. 7. Spoon a little bit of each color of icing into individual frosting bags with a #2 tips. Twist the open end of the bag to push the icing to the tip. 8. Squeeze the majority of the icing into a bowl then add 1 tsp of water to this icing and stir to mix the water and icing together. 9. 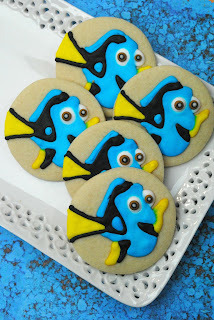 Using a edible marker, draw on dory using a easy cartoon image to replicate her. 10. 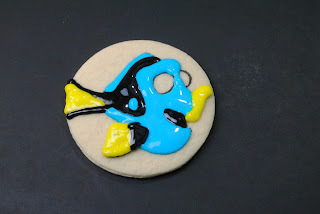 Using the blue icing, fill in the blue part on her body as well as the line on her fin..
12, Using the black icing, fill in the black part of her body, tail, and fin. 13. Using the yellow icing, fill in her tail, and both fins. 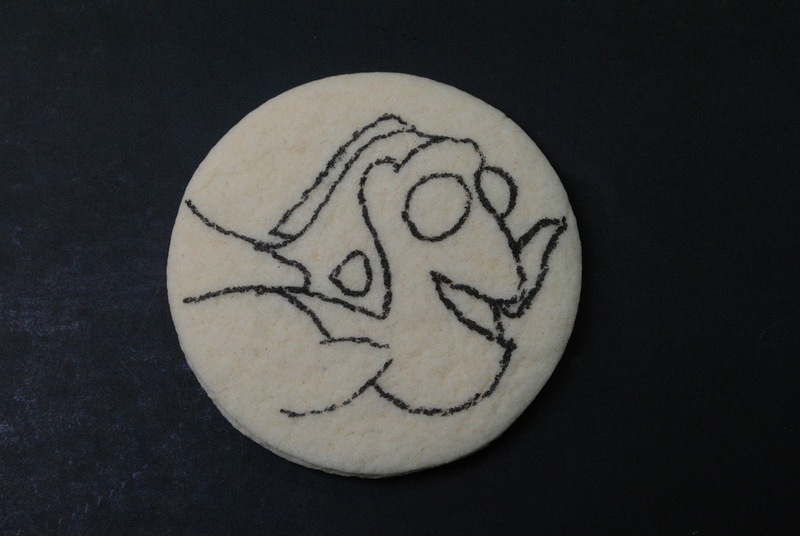 14, Using the white icing, fill in her eyes. 15. Using the brown, add a small dot in the middle of her eyes, for a iris. 16. Using the black icing, add the pupil.